I began to get a sense of the significance of this event when I learned that Pres. Bill Clinton, King Abdullah of Jordan, and Pres. Erdogan of Turkey were coming to Louisville. As much as America loved Ali, we have little idea what he meant to the rest of the world, how schools in Pakistan, for instance, would cancel classes so the kids could watch Ali battle for the Heavyweight Title of the World. 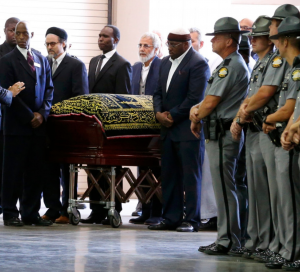 The Islamic funeral at Freedom Hall, the location of one of Ali’s first major fights, was attended by the most diverse group of people I’ve ever seen: a large percentage of African-Americans, some in T-shirts and shorts, others in tailored suits, women in elegant evening dresses, or colorful African attire; and white Kentuckians wearing everything from flip-flops and jeans to business casual and suits; and finally there was every kind of Muslim you could ever imagine. I wish I had the proper vocabulary to do justice to the colorful outfits that I saw: Pakistanis in kurtas, or shalwar kameez, Kurds in baggy pants, Arabs in Salafist style, long beards, skullcaps, and white robes; Bosnians with green berets; Senegalese in glittering robes. Imam Zaid Shakir warmly welcomed everyone and explained that this being a Muslim ceremony the non-Muslims would have to stand aside, and the Muslims would form rows 5 feet apart, with the women in the back. Then began the call and response chant: La illaha il Allah, repeated by the thousands of voices gathered there, then a sweet recitation of Surah Rahman, the chapter on Compassion, which calls to mind all the blessings of life. Then speeches by Dr. Sherman Jackson, and others, while we could not stop thinking of the man whose life and example had brought us all together. The next morning Ali’s body was transported in a motorcade through his old neighborhood, through downtown, and finally to the exquisitely beautiful Cave Hill Cemetery, as much an arboretum designed by Fredrick Law Olmstead, once for whites only. People lined every foot of the several miles of the route, an estimated 100,000 people, welcoming this world hero and hometown son who never forgot where he was from, and never stopped loving Louisville. 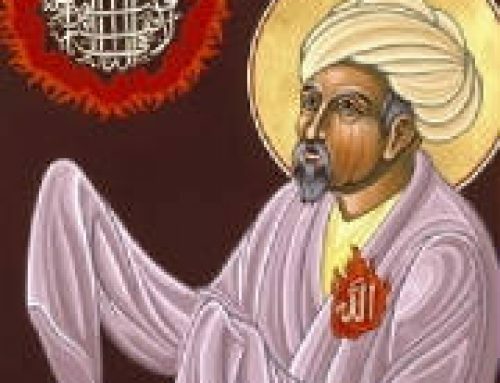 That afternoon at the Yum Center about 15,000 people gathered to listen to eulogies to this warrior for peace, to this Muslim who embraced Baptists and Jews, to this man of immense self-confidence and pride who was utterly humble before God. And it felt like a generous gift to Muslims from the Almighty, at a time when there is much misunderstanding and bad news, that the focus of the whole world would be on this one man, who once was nearly sent to jail for 10 years for resisting the Vietnam War, who used his wealth and influence to build the Muhammad Ali Center, a museum for social justice and human rights, in downtown Louisville, and who was the first and the greatest to make it clear that you can be Muslim and American without contradiction. Pres. Bill Clinton offered an extraordinary insight, saying that the first half of Ali’s life was devoted to his own unique talent, which we could never emulate, but the second half of his life was devoted to developing and expressing the attributes of the heart that every human being could emulate. Billy Chrystal did an imitation of Ali’s soft, suave voice announcing that he had now become an orthodox Jew and “Izzy Izzowitz is now The Greatest.” Rev. Cosby, a much loved Louisville pastor, said that before Muhammad Ali blacks felt like nobodies, but Ali taught them to be somebody. By unapologetically being himself, with style and humor, and even when faced with very painful consequences — losing his heavyweight title, facing a four-year legal battle that went all the way to the Supreme Court — Ali expressed his beautiful self. The impression left by these two days was not of one man, but of the relationship, a deep connection between one man and the people. Muhammad Ali was loved because of his faith, not despite it. Every kind of human being, and every kind of Muslim, showed him respect and love. His complete commitment to the message he embodied was heard and understood by all. Perhaps some of that commitment could be in us and make us better people. And in the final decades of his life he wholeheartedly embraced Sufism. The People’s Champ, the most powerful fighter on earth, walked a path that began with the Nation of Islam and Malcolm X, and ended with Hazrat Inayat Khan and Rumi. It’s true that his Heavyweight Title, his being named Athlete of the Century by Sports Illustrated and the Associated Press, gave him an unprecedented platform, but it was the grace of God and the power of his heart that allowed him to reach the soul of humanity with a simple direct message of love and respect. He is buried now less than a mile from where our Sufi circle meets, and Louisville is forever blessed by the presence of this Friend of God. 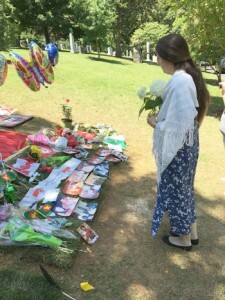 Camille at Ali’s grave placing a bouquet of Hydrangeas from our Sufi Zhikr Circle. Copyright © 2018 The Baraka Institute. All Rights Reserved.